Do you have a gardener on your list or maybe that hard to buy for person? 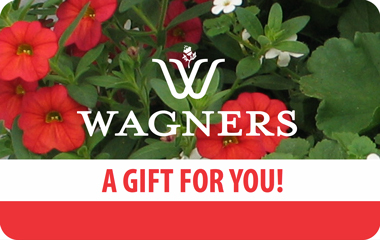 Wagners gift cards make a perfect gift for anyone who enjoys their yard and garden. Wagners gift cards are also great for the person who wants to add blooming or green plants to the inside of their home. Our gift cards are available in $25, $50, $75, and $100 amounts. Pick the perfect option to fit your needs. Pick them up in our stores or order online by filling out the form below and we will mail it to you or the recipient of your choice. Online payments are processed through PayPal. If you don’t have an account please check out as a guest.